Oil States’ Early Production Riser System ( EPRS), offers revenue from subsea wells before subsea production infrastructure is installed. 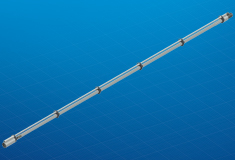 Using our Merlin® connector solution in open water allows floating installations to capture and produce oil and gas safely and economically while the downstream functions are completed, generating faster returns across the project. See completion workover riser animation here. 15K and 10K variations available. Self-contained makeup so floater without rotational facilities can be utilized.